The Special Collections is delighted to have recently added to its manuscript holdings the Archive of Honor Frost (1917-2010). Honor Frost was described as a woman of many talents – artist, ballet designer, scholar and writer – with a consuming passion for the world beneath the oceans. Honor Frost was a pioneer in the field of underwater archaeology and in its pursuit as a scientific discipline. Honor Frost studied at Central School of Art, London, and the Ruskin School of Art, Oxford, and then worked as a designer for the Ballet Rambert and director of publications at Tate Gallery before moving into the realm of archaeology. 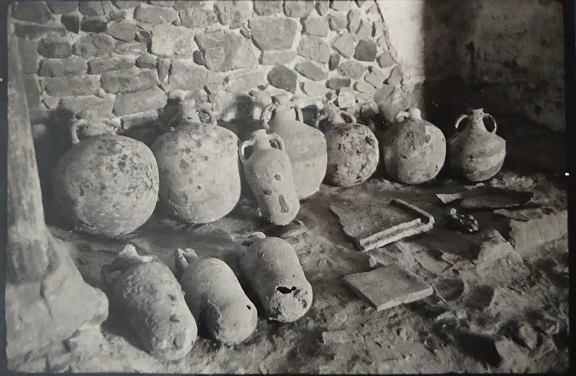 In her account of her early experiences as a maritime archaeologist Under the Mediterranean: travels with my bottle (1963) Honor wrote of how she was introduced to the delights of diving in a garden well in Wimbledon. Thus began a lifetime’s devotion to underwater discovery. In the early 1950s, she began training at Cannes with the Club Alpin Sous-Marin, where she met Jacques Cousteau, the inventor of the aqualung. Cousteau’s assistant, Frédéric Dumas, became her close friend and mentor. It was under Dumas’s guidance that she dived to her first wreck, that of a Roman ship at Anthéor, later know as the Chrétienne A. Honor Frost subsequently worked as a draftsman for an archaeological expedition led by Kathleen Kenyon at Jericho in 1957. Realising that terrestrial archaeology was not for her, Honor moved to Lebanon where, under the auspices of the Institut Français d’Archéologie in Beirut, she began to explore the ancient harbours of Byblos, Sidon and Tyre. This also marked the start of her interest in stone anchors: anchors being a key to identifying wrecks and showing trade patterns. In 1960, Honor was involved in the first season of the excavation off the coast of Turkey of a Bronze Age Phoenician ship. This was the first excavation of a shipwreck using techniques under the direction of underwater archaeologists, marking the genesis of scientific underwater archaeology. Between 1966 and 1967, Honor surveyed and partially excavated a Roman shipwreck, in Mellieha Bay, Malta. Among her most important projects was an expedition, sponsored by UNESCO, in 1968, which surveyed the Pharos (lighthouse) site in the Port of Alexandria. She confirmed the existence of ruins representing part of the Pharos, as well as the remains of submerged buildings representing the lost palace of Alexander and the Ptolemies, thus establishing the site’s importance. In 1969, the Sicilian authorities and the British School at Rome appointed Honor to direct the underwater survey of an area off the coast of western Sicily near Marsala. In August 1971, her team discovered a Punic shipwreck believed to have been a “longship” (perhaps an auxiliary military supply vessel) used by Carthage in the Battle of the Aegates Islands (241BC), the last battle of the First Punic War. For several years Honor and an international team of marine archaeologists worked on the site, before eventually restoring the wreck for display in a local building requisitioned for its museum display. Honor Frost was elected a Fellow of the Society of Antiquaries in 1969. 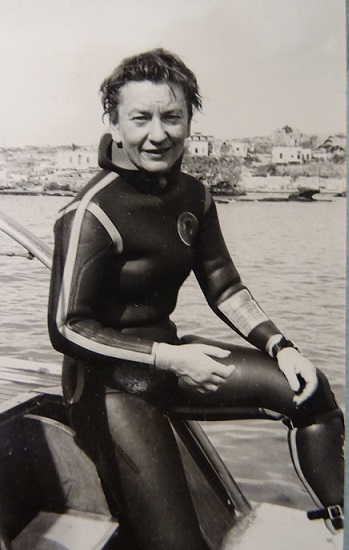 She was awarded a medal for pioneering submarine archaeology in Egypt by the French government in 1997, and, in 2005, the British Sub-Aqua Club presented her with the Colin McLeod award for furthering international co-operation in diving. The Honor Frost Archive (MS 439) provides a comprehensive and meticulously collated record of Honor Frost’s archaeological work. It includes significant material for her maritime projects in France, Sicily, Malta, Egypt, and in the Eastern Mediterranean (Lebanon, Syria and Turkey), together with material relating to Honor’s research on stone anchors and photographic material recording her excavations and travels. 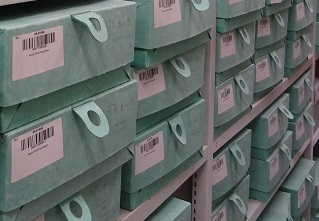 Most importantly the archive has an especially complete record for the Marsala ship expedition. Honor published and lectured prolifically and the archive contains original drafts and offprints of all her key publications on maritime archaeology, together with a comprehensive set of drafts of lectures, c.1961-2007. 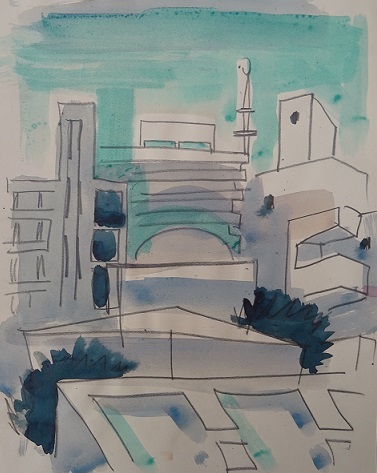 Archaeological drawings and sketches from Lebanon and early ballet set designs from 1940 to the mid-1950s beautifully illustrate Honor Frost’s artistic skill. A prolific letter writer, the archive contains a series of correspondence that Honor maintained with other key figures in the field of underwater archaeology, including Frédéric Dumas, Lucien Basch and Paul Adam. Due to her practice of keeping drafts or carbon copies of letters sent, there is often outgoing correspondence to supplement that of letters received. The Honor Frost Archive provides a fascinating insight into the work of a pioneering figure and will be available to researchers from 30 March 2018: See the access arrangements for the Archives and Manuscripts. The Honor Frost Foundation seeks to promote the advancement and research of maritime archaeology. The Centre for Maritime Archaeology provides a focus for maritime archaeological research at the University of Southampton. This entry was posted in Acquisitions, Manuscript Collections and tagged Archaeology, maritime, underwater. Bookmark the permalink. A great asset to the University from a true pioneer.